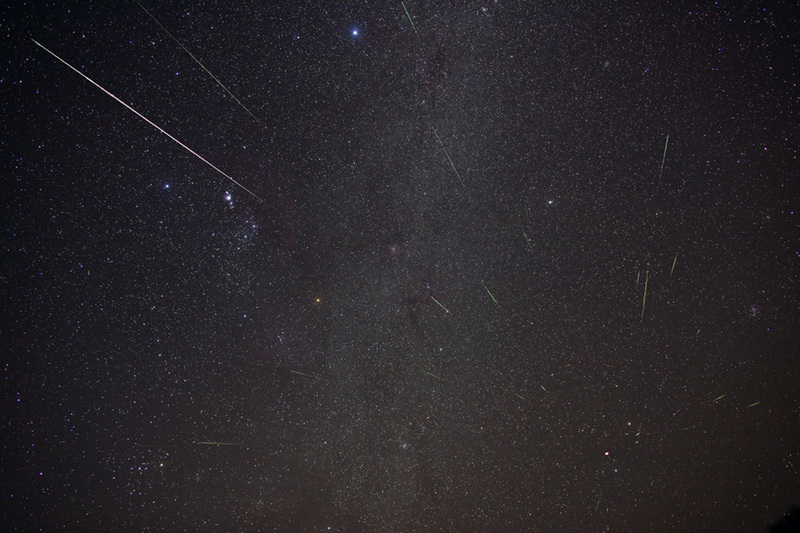 Explanation: At least 34 meteors are included in this composite image as they rain through Australian skies during the annual Geminid Meteor shower. Dust particles strung out along the orbit of extinct comet Phaethon vaporize when they plow through planet Earth's atmosphere causing the impressive display. Although the particles are traveling parallel to each other, the resulting streaks clearly seem to radiate from a single point on the sky near Gemini's twin stars Castor and Pollux at the lower right. The radiant effect is due to perspective, as the parallel tracks appear to converge at a distance. Taken over a period of 2 hours on the morning of December 14, short exposures recording individual meteor streaks were combined with a single long exposure to show the background stars, with Sirius at the top, and the constellation Orion at left. Faint stars and nebulae of the Milky Way track through the center of the frame. Near the radiant point, an extra star in Gemini is actually the flash of a meteor seen almost head-on.